9th March 2018, New Delhi: It has been 250 days since GST was introduced in India. It was the first time any country had made changes of this magnitude to their taxation system. Many compared this business tax over-hauling with an economic revolution. After the initial hick ups, the overall GST process and collection seems to be settling down but its positive effect on the lives of the end consumers is yet to be concretely ascertained. 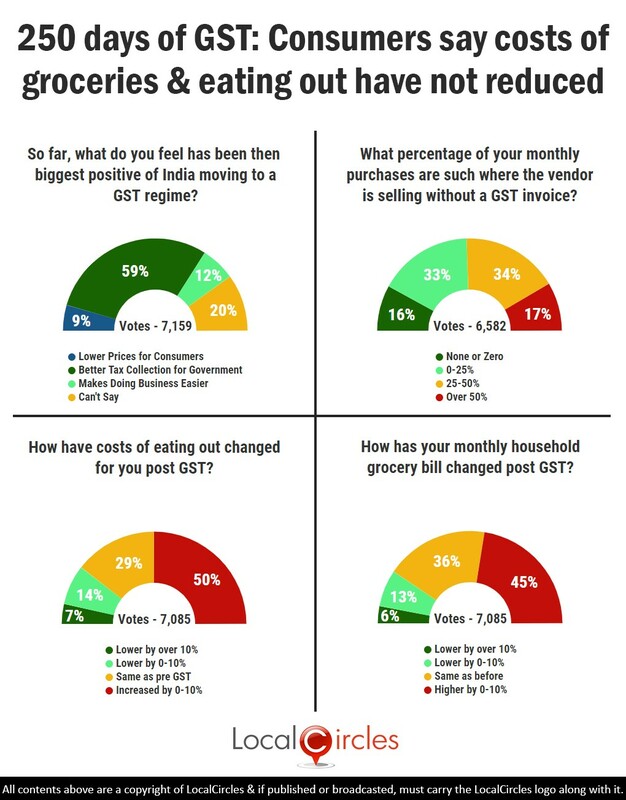 LocalCircles carried out a pulse check the understand the impact of GST on the citizens in the last 250 days. The survey which contained 4 polls received more than 20,000+ votes. The first question asked what so far has been the biggest positive of India moving on to the GST regime. 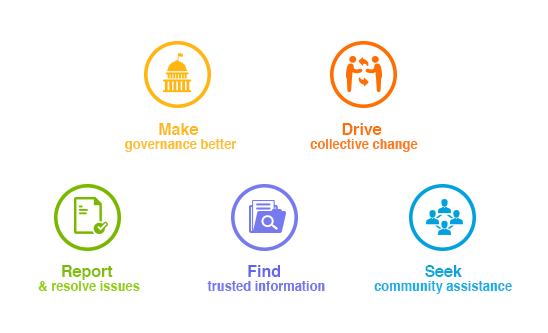 59% said it was better tax collection for government and 12% said it makes doing business easier. 9% said prices for consumers had lowered while 20% were unsure. The GST collection for the government have been improving every month and they have set an aggressive target for this financial year. The benefits of GST are also taking time in reaching the end consumer and hence only a small percentage feel that it has had a positive impact on their monthly spending. 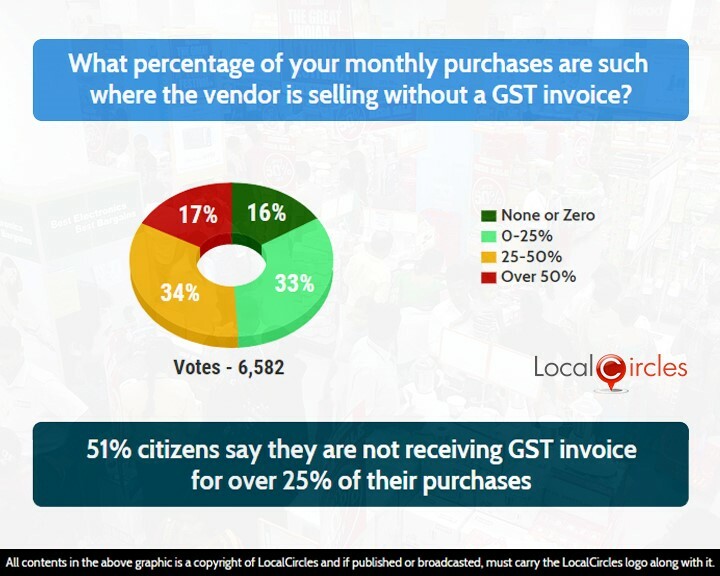 Second question asked people what percentage of their monthly purchases were such, where the vendor was selling without a GST invoice.16% said none of them, 33% said 0-25%, 34% said 25-50% and 17% said over 50%. 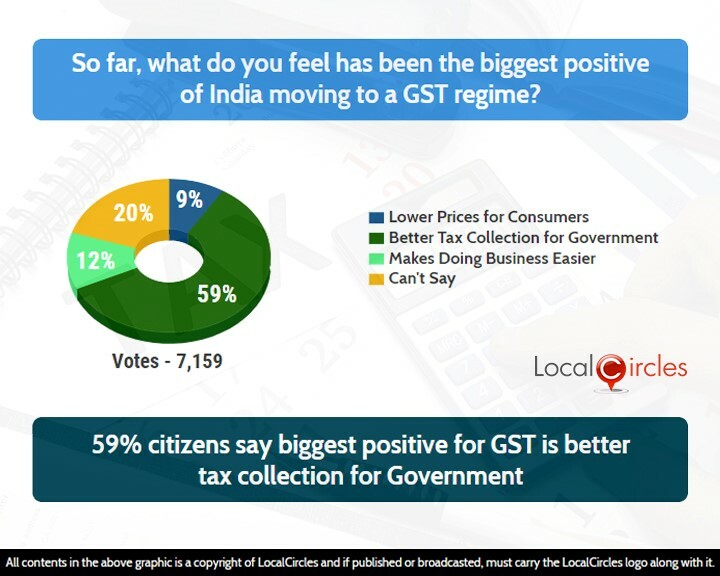 An earlier LocalCircles poll showed that 1 in every 4 transactions was happening outside the GST system and without an invoice. Retailers are trying to find ways to beat the GST system and selling goods without an invoice seems to be one of them. 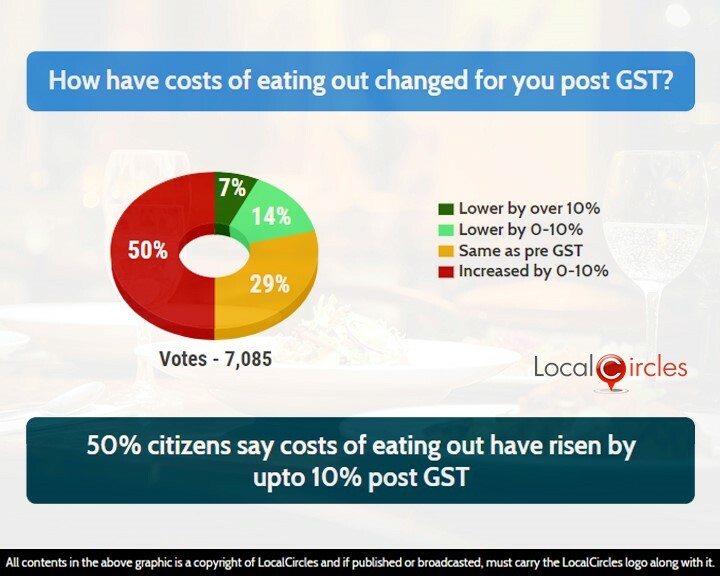 In the following questions, 50% citizens said that their ‘eating out costs’ have increased by 0-10% post GST. 7% said it had reduce by over 10%, 14% said it had reduced by 0-10% and 29% said it was same as pre-GST. Many citizens have also complained that restaurants have not passed on the benefits of the lowered GST to them and have in turn kept the final pricing the same. Many blame the abolishment of input tax credit for this, but it is finally the consumer who take the beating with higher bills. Last question asked how their monthly household grocery bill has changed post GST. 6% said lowered by over 10%, 13% said lowered by 0-10%, 36% said it was sane as before while, 45% said it had increased by 0-10%. 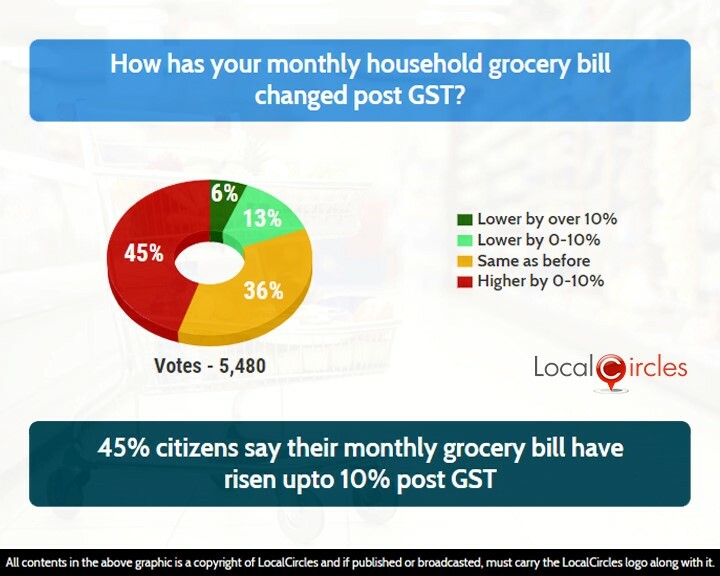 This means that majority are saying their household grocery bills have not reduced post GST. Many brands have benefitted from the input tax credit that they receive while buying raw materials but have still not reduced the MRP of their products, resulting in benefits not flowing down to the consumers. Although introduction of GST has been termed as a solid step by experts and the government saying its benefits will be soon visible, consumers have received no respite from the increasing household expenses.